John Bolton takes over as President Trump's national security adviser at a rather dramatic moment. And aside from all the news, there's the broader question of how the United States relates to Islam and how John Bolton relates to Islam. President Trump, of course, famously imposed a travel ban seen as targeting majority-Muslim countries. He's also developed warm relations with Muslim-majority nations like Saudi Arabia. But now he is installing a new national security team, and both Bolton as well as Secretary of State nominee Mike Pompeo have made harsh comments about Islam. NPR's Tom Gjelten reports on the administration's approach to global Islam. TOM GJELTEN, BYLINE: Mike Pompeo, now the CIA director, was known for his outspoken comments about Islam during three terms as a congressman from Kansas, like when he suggested to a church group in his native Wichita that the fight against Muslim extremists is a kind of holy war. MIKE POMPEO: We need to recognize that these folks believe that it is religiously driven for them to wipe Christians from the face of the earth and will continue to press against us until we make sure that we pray, and stand, and fight and make sure that we know that Jesus Christ as our savior is truly the only solution for our world. GJELTEN: That was in 2014. Pompeo, back then, presumably was not thinking he'd ever be secretary of state, leading U.S. diplomatic efforts. There is a sizable Muslim community in Wichita. Hussam Madi, the spokesman at the local mosque, says Pompeo's comments about Islam over the years have unnerved Wichita Muslims. HUSSAM MADI: Not only just bothers them, it probably scares them because what that does is ignites the others that are holding some hatred or even are willing to take their thoughts into actions and do hurt someone that might practice the Muslim faith. GJELTEN: As for John Bolton, the president's new national security adviser, he's been a popular speaker at gatherings where anti-Muslim rhetoric is rampant, and he wrote the foreword to a book authored by two fierce American critics of Islam. A Bolton aide said he is not available for comment. 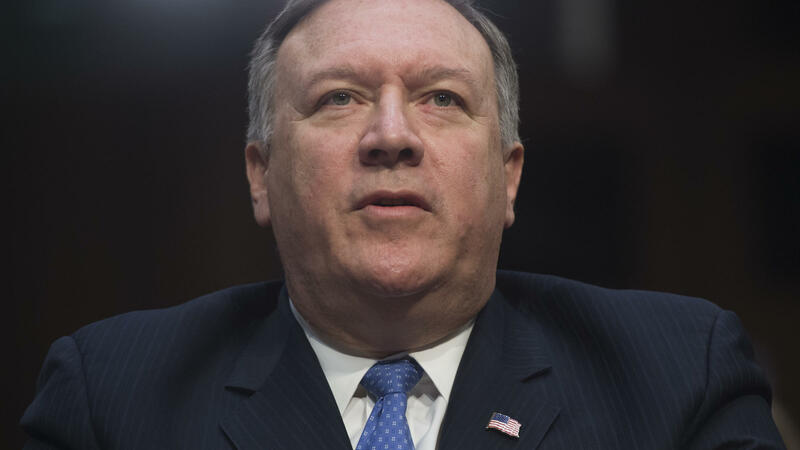 A CIA spokesperson asked about director Pompeo's prior statements about Islam said only that at the agency, he has worked to strengthen partnerships throughout the Muslim world. Saudi Arabia and its Gulf allies are the notable examples. They were cool to President Obama, but with President Trump, they share a deep distrust of Iran. BRIAN KATULIS: They're, I think, quite happy and I think look at the Trump administration with a sigh of relief. GJELTEN: Brian Katulis is a Middle East specialist who served in the Clinton administration and now works at the Center for American Progress, a left-leaning think tank. KATULIS: When I've been in the region and talked to many leaders, they were glad to see Obama go, in part because he did not pick their side. He tried to keep America above the fray and not engage deeply in these political conflicts. GJELTEN: So the Trump administration's rhetoric and policies may antagonize American Muslims and perhaps even stir anti-Muslim sentiment here, but that's not a huge concern, apparently, to Muslim governments focused on their own security. NIHAD AWAD: To me, that is unfortunate and painful to see. GJELTEN: Nihad Awad directs the Council on American-Islamic Relations. AWAD: ...Key influential leaders in so-called Muslim countries dealing with hateful anti-Muslim bigots and organizations just to save their throne or to protect their own interests. GJELTEN: For the Trump administration, it's about power politics. There is a cost. Here at home, Muslims report increasing harassment. Overseas, there's less emphasis on engaging Muslim hearts and minds. Farah Pandith worked on global Muslim outreach under Presidents Bush and Obama. She concluded an us-versus-them mindset drives young Muslims to radicalism. The U.S., Pandith argues, needs to challenge that mentality. FARAH PANDITH: The commander in chief and his entire cabinet need to make sure that everything that they're doing hits that chord. GJELTEN: When anti-Muslim or anti-Islam rhetoric in the U.S. is not challenged, Pandith says, the terrorists gain. PANDITH: They take our words and use it against us. They create videos. They create sound bites so that they can say, look, we told you that the West is against Islam; we told you that America hates Muslims, and look, we can prove it. GJELTEN: The CIA spokesperson counters, the new partnerships in the Middle East are keeping Americans safe. That's the approach a Pompeo-Bolton team would presumably follow, even if it means leaving American Muslims on the sidelines. Tom Gjelten, NPR News.